roofing contractor, Florida roof-a-cide applicator opportunities. Roofing contractor opportunities, you can now offer Roof-A-Cide® Algae Stain Prevention and Protection. Guaranteed performance and exactly what your HOA, Condominium and Community property managers are looking for. Roofing contractor, Authorized Applicator opportunities in; Pensacola &Tampa,. Pasco & Polk Counties. FRSA Annual Convention and the Florida Roofing & Sheet Metal Expo, July 17-19, 2019 at the Gaylord Palms Resort and Convention Center, Kissimmee, Fl. Roof Restore® Cleaner and Roof-A-Cide® Algae Preventative – Guarantee a long term solution that is cost-effective and the safest alternative to roof cleaning. Roofing contractors, our applicator program is an excellent opportunity to expand your core business and create residual income. A preventative roof maintenance program will set you apart from your competition, retain your customers and their loyalty. The Roof-A-Cide® Stain Prevention Program eliminates any need for future high pressure, toxic chlorine or other harsh chemical cleaning. Unless your customer purchased an algae resistant asphalt shingle, their roof will typically start to show algae growth and stains in as little as ONE year after installation. Roof Restore® Cleaner is applied in a fine mist with 60-80 psi over the roof and within minute’s algae, moss, mold, mildew and fungus will be washed away with a gentle water rinse. Quickly restores an asphalt shingle or stone coated steel roof to its original color. 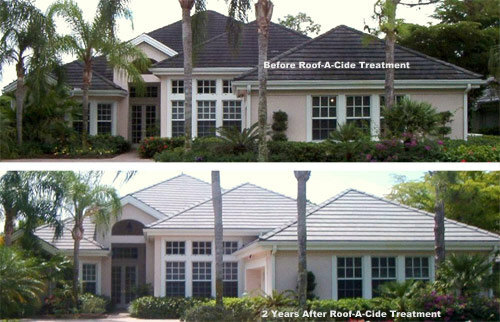 Roof-A-Cide® Algae Stain Preventative treatment is applied with a light spray to a dry roof, no rinsing. Cost-effective retreatments will keep the roof free from algae, moss, mold, mildew and fungus. Guaranteed satisfaction, 2-year Unconditional transferable warranty.